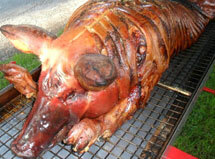 Welcome to the Village Hog Roast, a Hub for all your Hog Roast catering requirements! Based in Yorkshire, we are a well-known hog roast catering service provider known for quality services and exceptional hospitality. With a team of expert chefs, we can provide the best catering services, specialized in Hog Roast for all your important events like Birthday, Wedding, Christianity, Baptism, Corporate Events and even more. We supply our Hog Roast food in Yorkshire and nearby places including Harrogate, York, Leeds, Huddersfield, Skipton, Bradford and many other places. Our dishes including roasted meat, roasting lamb, beef, or fresh prime hog are delicious and mouth watering. Whether you are seeking indoor or outdoor catering services, we offer all! The Village Hog Roast feels privileged to offer the best Hog Roast Yorkshire Catering services, keeping quality and hygiene as its first foremost priorities. For the last few years, we have been successfully serving the people of Yorkshire and nearby areas. Whether your event is small or big, we pay attention to every detail, quality and presentation of our dishes. We can provide the best exquisite barbeques or hog roasts, ensuring that your experience with the Village Hog Roast is a memorable one. With so many hog roast catering services available, choosing a right one is really a big task. But relax! We will tell you the precise reasons why to choose The Village Hog Roast! • Over a last few years, we have been providing the best hog roast services not only in Yorkshire, but in other areas as well. • For us, client contentment and satisfaction is the top priority. • All our dishes are cooked in a proper hygiene and clean area. • Our chefs are expert and providing service for a long time span. • We maintain our standard by providing the best quality food at affordable rates, without compromising on any sort of quality. We take pride to provide services throughout Yorkshire, year around, regardless of your budget and size of the event.